After reading this, please copy and paste and send to your friends and neighbors in Region One, or cross-post on Facebook, or any other social media outlet. This needs to be addressed in Region One. According to the Workplace Bullying Institute, up to a third of workers may be the victims of workplace bullying. About twenty percent of workplace bullying crosses the line into harassment. The New York Times found that about sixty percent of workplace bullies are men, and they tend to bully male and female employees equally. Female bullies, however, are more likely to bully other females. This may be because there is more pressure on females trying to succeed in male-dominated workplace, and more competition between females for promotions. Difficulty hiring quality employees as word spreads that the company has a hostile work environment. Because workplace bullying can be devastating to employees and companies, some companies have instituted zero-tolerance policies toward workplace bullying. In these companies, if an employee is being bullied he or she needs to document the bullying and present the problem to the proper person in the company, usually someone in human resources or upper management. Companies with good anti-bullying policies usually hold meetings from time to time to remind employees what workplace bullying is, how to report it, and the consequences for bullying. In some companies, however, there is a company culture of workplace bullying. Usually companies do not purposefully support bullying, but they may develop a problem with it either through not taking workplace bullying seriously or by developing the habit of placing blame and fault-finding instead of solving problems. Workplace bullying has effects on those who witness it as well as those who experience it, affecting the overall health of an organization. Victims spend much of their time trying to gain support and defend themselves from the bullying, time that would otherwise be spent working. Dr. Charlotte Rayner, a U.K. researcher, found that 20 percent of those who witness workplace bullying look for another job and that 98 percent are distressed by it. Other effects of bullying on workplace productivity include greater absenteeism and turnover, more accidents, lower quality customer service, higher costs for employee assistance programs and decreased motivation and morale. This is another possible reason bullies are getting ahead: According to the Workplace Bullying Institute, 50 percent of workers don’t report bullying they see or experience. Instead, many workers practice conflict avoidance, reasoning that an angered bully is a more dangerous bully and that staying out-of-the-way is the best way to personal survival. According to research published in the Harvard Business Review, workplace bullying can be contagious. Bullying behavior (especially if such behavior seems to be rewarded) can encourage non-bullies, or victims, to take up abusive behavior themselves. In this way, the act of bullying by one individual can impact an entire company by fostering behavior that trickles down the entire organizational ladder. 1. Establish an anti-bullying policy. Establish and implement clear policies and reporting procedures that address bullying. Most companies have code of conduct policies, but many of those policies are general, and/or solely address unethical and financial misconduct. Rarely do companies maintain policies with specific language that adequately defines a range of prohibited behaviors. 2. Implement company wide training that addresses bullying. Once a sound policy has been established with clear and multiple reporting mechanisms in place, leaders must ensure all managers and employees receive training on how to identify, respond and report potential bullying behaviors. Because many managers and employees have trouble distinguishing bullying behaviors from workplace violence and unprofessional behaviors, it is critical that training underscore the many ways bullies target their victims in the workplace. Unlike one misdirected and unprofessional comment, bullies perpetrate a pattern of coercive control, often isolating their targets, undermining their work,and engaging in aggressive and humiliating behavior. Bullies are often known to most in the company. They are the “elephants in the room” much like perpetrators of domestic violence. Like batterers, bullies minimize, deny, sidetrack and blame their targets, hoping to avoid accountability for their actions. Training must separate managers from employees, and highlight the challenges and fears employees struggle with in reporting these kinds of behaviors. 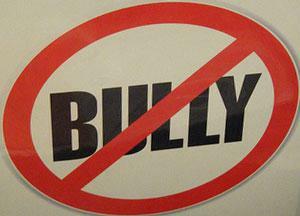 Hold bullies accountable for their behavior by consistently and fairly implementing appropriate disciplinary action. Not unlike a worker who has violated a company’s sexual harassment or workplace violence policy, employers must investigate all complaints related to mutual respect policy violations. Depending on the nature of the behavior and/or impact on the target, employers must take swift action and discipline workplace bullies – up to and including termination, if necessary. Sometimes, a bully who is confronted with the possibility of disciplinary action, including the fact that his/her behavior has negatively impacted another employee, will take steps to alter his or her behavior. Progressive disciplinary action can be combined with remedial training in some cases. I strongly discourage any form of mediation in these cases. Time to freshen up a bit! Now that we are WELL NORTH of 100,000 visits!